Lavender is a versatile, popular oil with a beloved scent. Applied directly to the skin, it is known for helping to relieve muscle tightness and skin irritations. When ingested, lavender oil may help soothe overworked nerves and promote a restful night of sleep. Diffusing lavender fills the room with a light floral scent. It is highly sought after for its benefits as part of a soothing nighttime routine. Topical – Dilute a single drop of oil with 10 to 12 drops of Isagenix Coconut Application Oil and apply the mixture to your skin as desired. 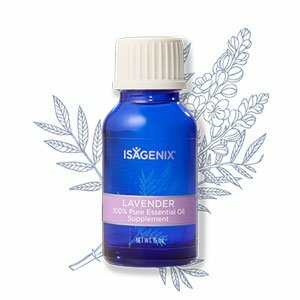 Internal – In 4 ounces of liquid, dilute a single drop of lavender oil. Aromatic – Use your Isagenix Diffuser loaded with 8 to 10 drops of oil to fill the room with a lovely aroma.